EF English First, Suzhou is now recruiting native English language teachers for summer positions running from 24th June to mid August 2015. We are looking for energetic, committed young learner teachers who have the creativity and resourcefulness to educate our students while ensuring they have fun doing so. English First, Suzhou has 2 schools, the first opened in 2003 and the second in 2006. We employ 25 foreign teachers and pride ourselves on our professionalism and the quality of the courses we offer to our students, aged from 4 to 18 years old. Our schools are modern, well equipped and progressive with IWBs in each room and school-wide WiFi. Classes are based on EFs own syllabus and text books, and lesson plans and materials are provided. Students study in classes of no more than 15 per class, often less and all students are placement tested when they begin to ensure there are no mixed level classes. Our school takes teacher training seriously believing in the importance of on-going learning to develop into an effective teacher. We offer a two week training program before the teaching begins, which will cover our teaching methods, materials, training on using the interactive white boards amongst other things to prepare you for the classes. Come and work in a supportive environment where every day brings new challenges and rewards. Suzhou is a renowned cultural, historic and tourist city. The city is located in the southeast of Jiangsu Province, bordering Shanghai on the east. Written historical records indicate that Suzhou has a history of over 4000 years and the city is now best known around China for its unique and plentiful gardens and its many streams and canals, which have earned it the nickname ※Venice of the East§. In early years, teahouses and theatres were the most common nightlife activities. With the development of tourism however, there are multiple more fashionable choices in Suzhou now. 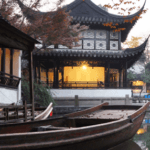 Suzhou is widely known in China as being one of the most livable cities in China, with a buzzing expat community and friendly locals. You will not enjoy only good food there, but also cosmopolitan atmosphere of nightlife activities including cafes, bars, teahouses, theatres and cinemas.